As a result of invoking Article 50 of the EU treaty in March 2017, the U.K. was given a two year period to hammer out a deal with EU officials and successfully get it through the House of Commons. If Mrs. May's government fails to pass an agreement in the House of Commons by March 29, the U.K. faces the prospect of a no-deal, commonly known as a "hard Brexit." The likelihood of a no deal is increasing in the wake of Parliament's rejection of the Brexit agreement. On Thursday, Mrs. May indicated that her government could not make substantial changes to the agreement. As a result, EU member states such as France have begun to prepare for the event of a no-deal. France is considering legislation that would appropriate an additional $57 million to ports and airports. The possibility of a deadline extension is becoming increasingly likely given that both EU leaders and the U.K. government want to avoid a no-deal Brexit. The EU has indicated a willingness to grant an extension in response to parliament rejecting the agreement. May has not categorically ruled out the possibility of an extension, claiming to seek a "smooth and orderly" exit from the EU despite openly opposing any extensions. However, there is disagreement of the desired goal of an extension. EU officials have signaled thus far that an extension would be allowed in the case of a U.K. general election or another Brexit referendum. May's government would presumably seek an extension only to continue negotiating a deal until it passes through parliament. The granting of an extension is heavily opposed by hardline Brexit supporters within May's camp. Given May's indications that any changes to the agreement by March is out of the picture, the potential for a successful deal is unlikely. May called Corbyn to the negotiating table on January 17, but he has demanded that a no-deal outcome be ruled out before he engages in further negotiations. One of the more controversial components of Mrs. May's proposal which lost the support of hardline Brexit supporters was the initiation of a "backstop." In the event of a hard Brexit, the movement of goods and people across the border between Northern Ireland and the Republic of Ireland would be subject to inspection. Both Northern Ireland and the Republic of Ireland have indicated a desire to keep an open border, which would require the Northern Ireland to continue to be apart of the EU's single market. 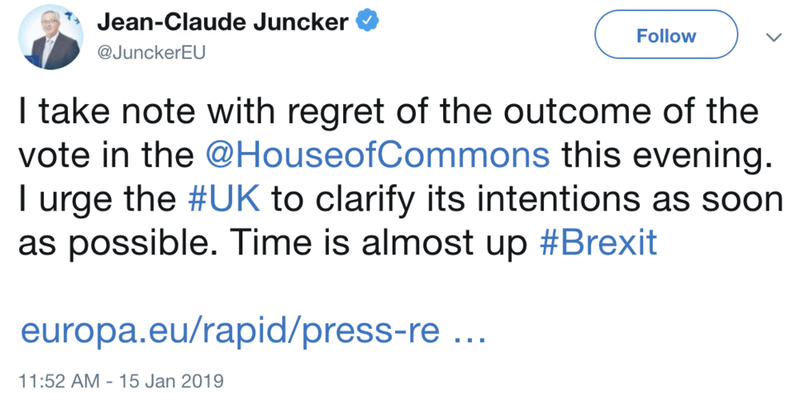 Thus, a backstop would be a fallback agreement to preserve the open border if a larger agreement fails to pass. However, Brexit supporters in the U.K. see the backstop proposal as preserving the U.K. as a de-facto EU member state. Realistically, an extension is the most likely outcome of the process come March. It's only a matter of time before May accepts the reality of an extension. Former Prime Minister Tony Blair said in an interview on January 17 that an extension is "inevitable." The larger question is what exactly an extension will accomplish, whether it be another referendum, a general election, or renegotiations. Stay tuned for more coverage of Brexit in Compass World.